Why would anyone want to do such a trip in the middle of summer when temperatures are at their highest is probably the first question to come to your mind? It’s perfectly normal to want to see some of our great country when the weather is at it’s best but in the heat in just eight days? Well I admit this wasn’t my idea but Hubby’s. 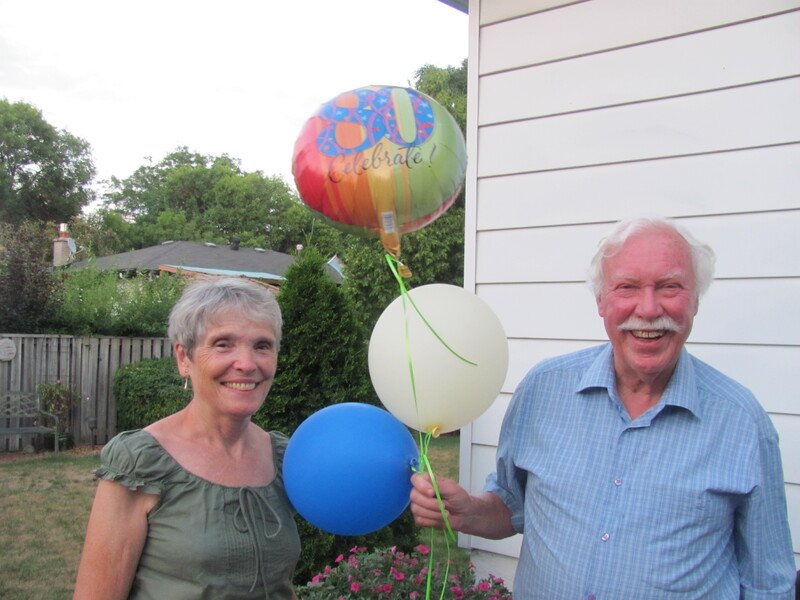 It all had to do with his birthday in July which would have him turning 80! 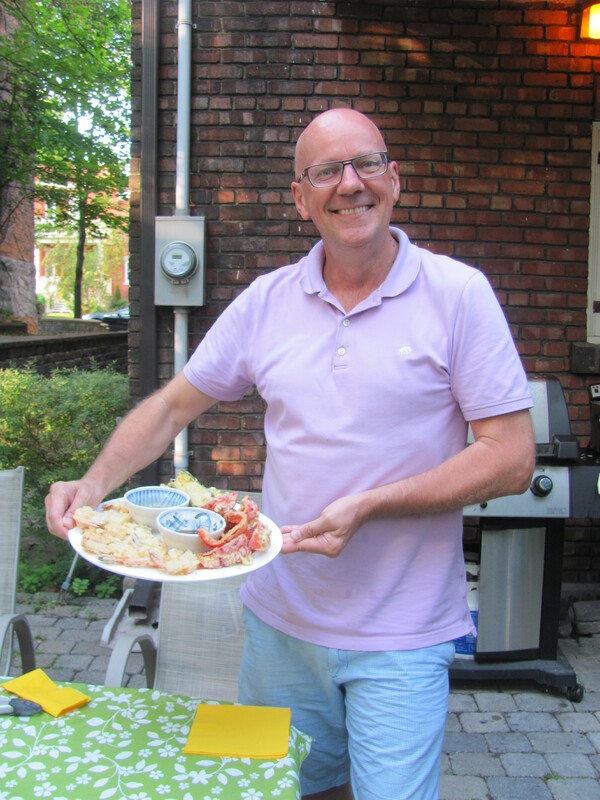 When he casually informed me back in early June of his grand scheme to celebrate with a trip up to Quebec and Ontario, my initial reaction was “Why not?” If that’s what he wanted then he deserved to celebrate this milestone with his family and close friends from his past. While he was away doing that I could get caught up on my writing and reading and try to keep my garden alive in the midst of our mini drought. Furthermore, I had the Saturday morning market to consider. I couldn’t just leave all my merchandise, and if I did who could I solicit to tend my table and sell my wares? After some internal debate, I decided I would accompany him on his slightly hair-brained quest. I had found someone to water the garden and to tend my table at the market. Quite frankly I was a little worried about all that driving on his own, and besides my yen for travel was again beginning to surface. This trip held some other benefits for me, too. My daughter and her family could meet up with us in Montreal, and I could also see some old friends in Ontario. Hey, this “hair-brained” scheme was beginning to look better all the time. We set out on August 6th, a Thursday, on one of those perfect summer days where the sky was a brilliant blue with puffs of fluffy white clouds on the horizon. At the border of Nova Scotia and New Brunswick. 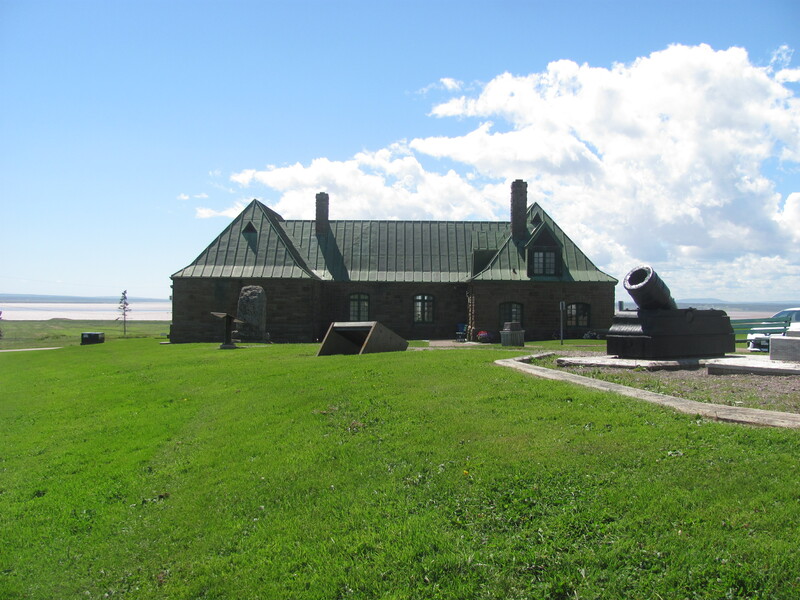 Fort Beausejour in Aulac, NB. The temperature was in the low to mid 20’s. 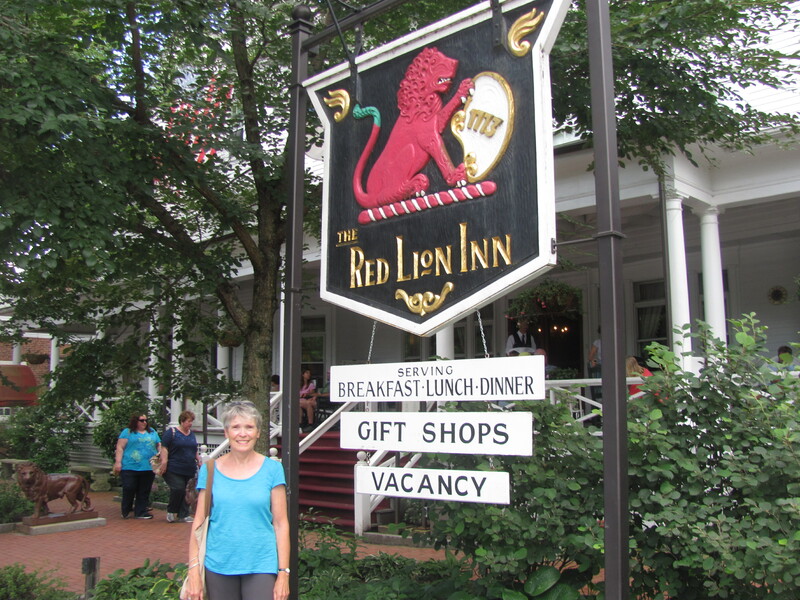 We decided to take the Canadian route up through New Brunswick and into Quebec choosing our first stop for a bed in the capital city of Fredericton. Here we found a great bargain at the Aiken House on the campus of UNB (University of New Brunswick). For our own private room and a delicious breakfast we paid $62.00. Everything was clean and comfortable for half the price of a hotel for this time of the year. 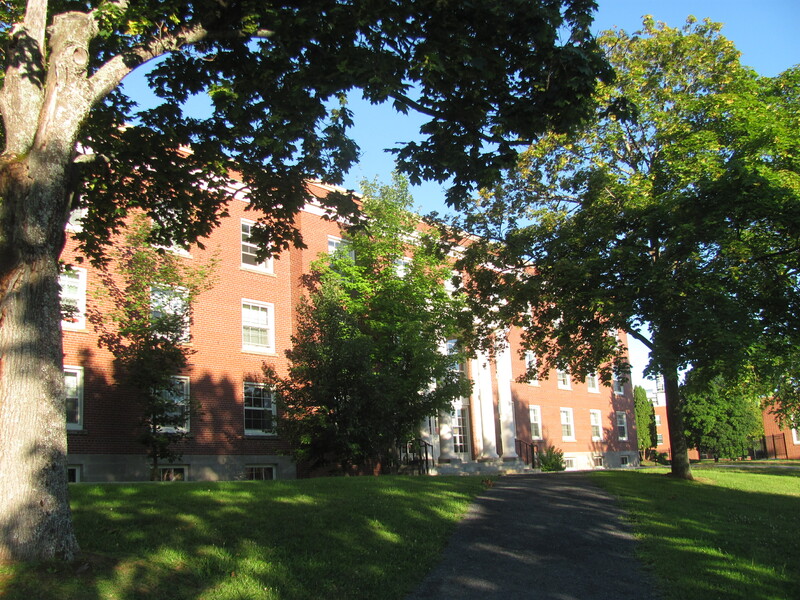 Stately Aiken House on the campus of UNB. 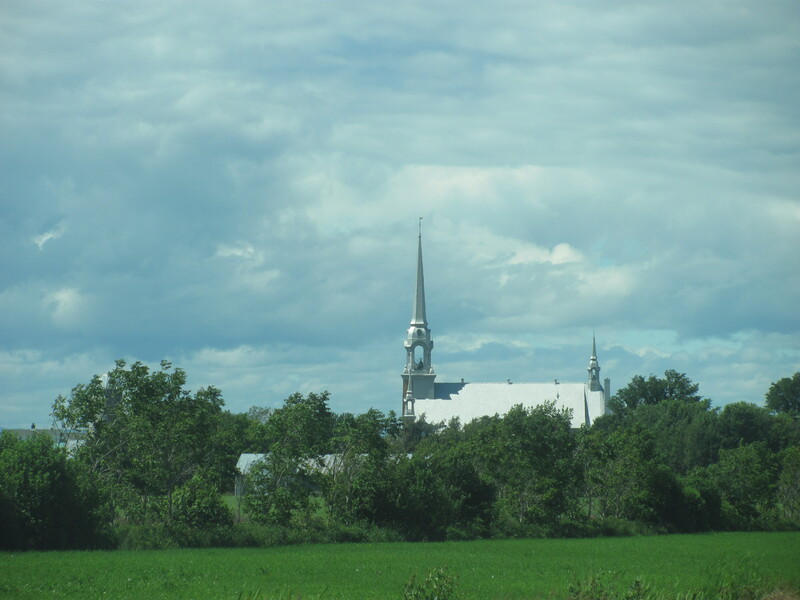 On our second day, we continued north on the Trans Canada stopping in Edmunston for lunch and then at the picture perfect town of Kamouraska on the St. Lawrence River. 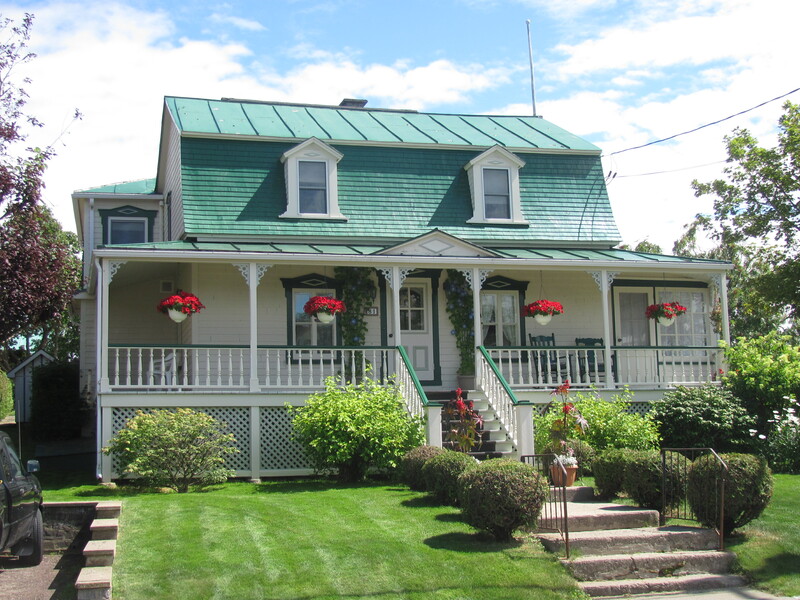 Here one finds the true flavour of a French Canadian village with its distinctive architecture and rolling farmland bordering on the mighty St.Lawrence. Whenever we drive up to Quebec, we have always stopped here for one of those truly delicious croissants or some other kind of mouth-watering pastry to take to our hosts where we are staying for the night. A typical French Canadian home. So that night found us in Quebec City where we were treated to the wonderful hospitality of some of Hubby’s old friends. Even though they had eight family members already descending upon them, they insisted that we stay. 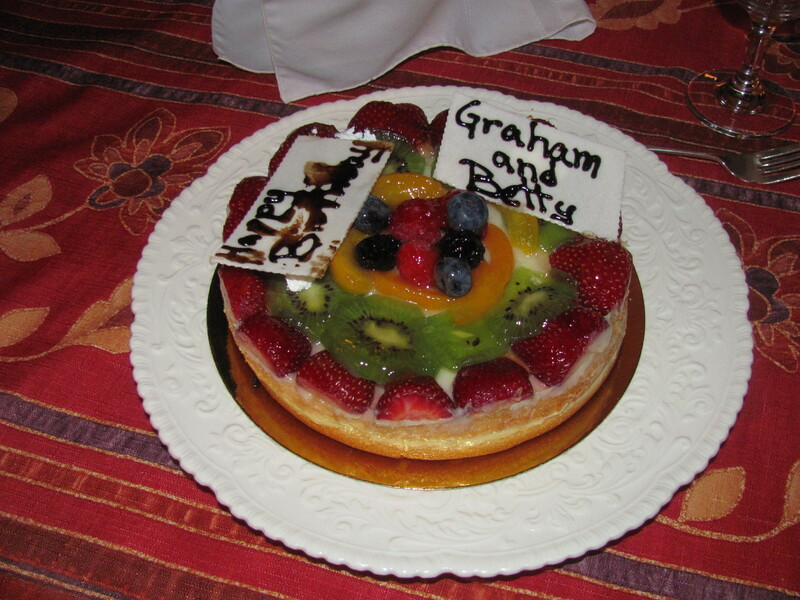 They even had a birthday cake for us (I had celebrated my 70th just days ago)! Wine and stimulating conversation dominated that night and into the morning primarily from their children who all seem to have landed themselves super exciting jobs as a radio producer at CBC, a city planner for Vancouver, and a marketing aficionado for a windmill company. Hubby and I couldn’t help but marvel at how so many children and grandchildren could come together and have such fun together. 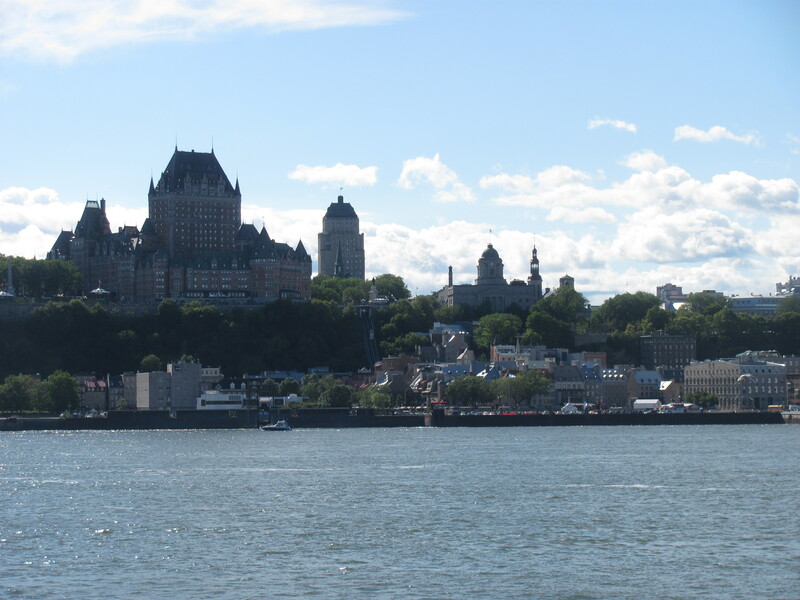 Quebec City with the Chateau Frontenac dominating. 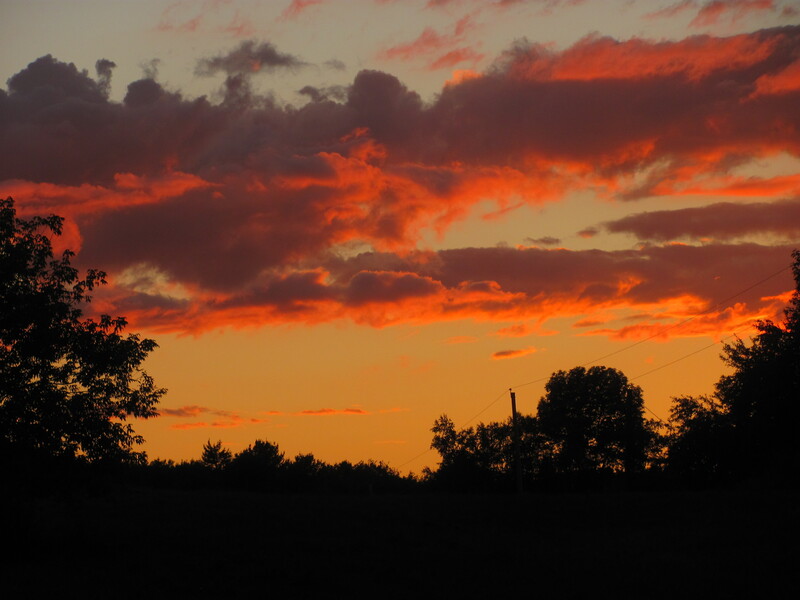 The next day of more sun and delightful temperatures put us on the road to Montreal and the home of Hubby’s daughter and family where we also managed to meet up with my daughter and her family. 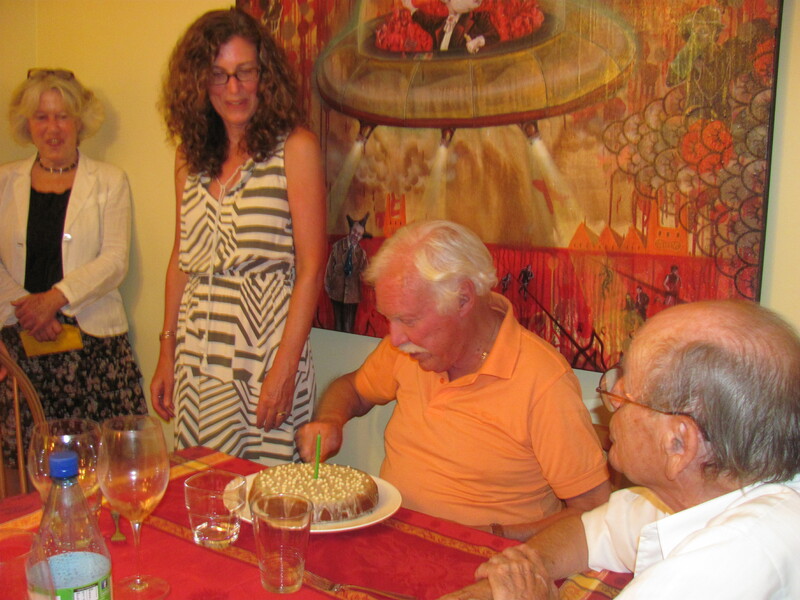 That night we celebrated his 80th once again with his son and partner, one granddaughter, and two of his friends from his days of involvement with the Quebec Film Society. This was a night to remember for him as everyone was asked to give one word that would best sum up this colourful man. There were two words that kept popping up: ‘enthusiastic’ and ‘positive’. I couldn’t agree more. Even though at times his approach to life can be too rosy for my liking, in the end it’s better than having to live with one whose attitude is the opposite. Moreover, it’s what keeps him young if not in body but in spirit. We spent one more day in Montreal just enjoying the coming together of our families who seemed to blend in with each other so well. 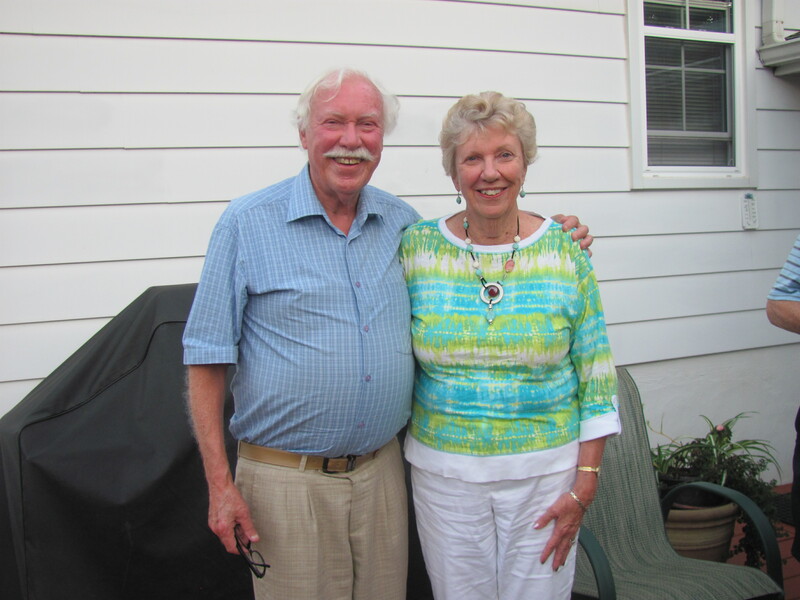 They had all taken the time from their busy schedules to be with us to celebrate our milestone birthdays. 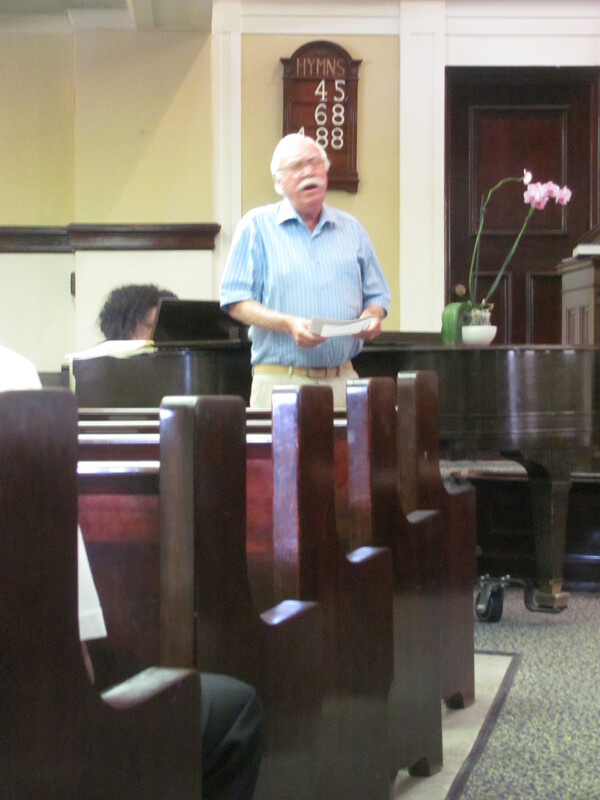 A church service in a nearby Baptist church where Hubby had somehow managed to end up singing a solo, a lunch at Nick’s Place, a walk in a lovely Westmount park, and a delicious Japanese dinner rustled up by Hubby’s son-in-law were the highlights of this Sunday. 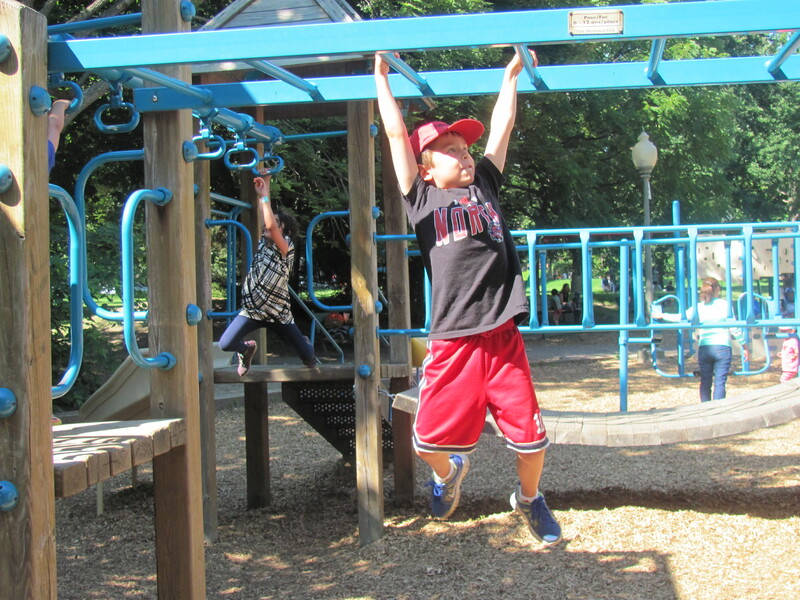 My grandson having fun at the Westmount park. Son-in-law showing off his culinary creations. From Montreal we began our trip next day to the province of Ontario and the city of Burlington to visit Hubby’s sister. Having lived in this province for over 20 years, we were both dreading the drive along the 401 especially once we neared Toronto. 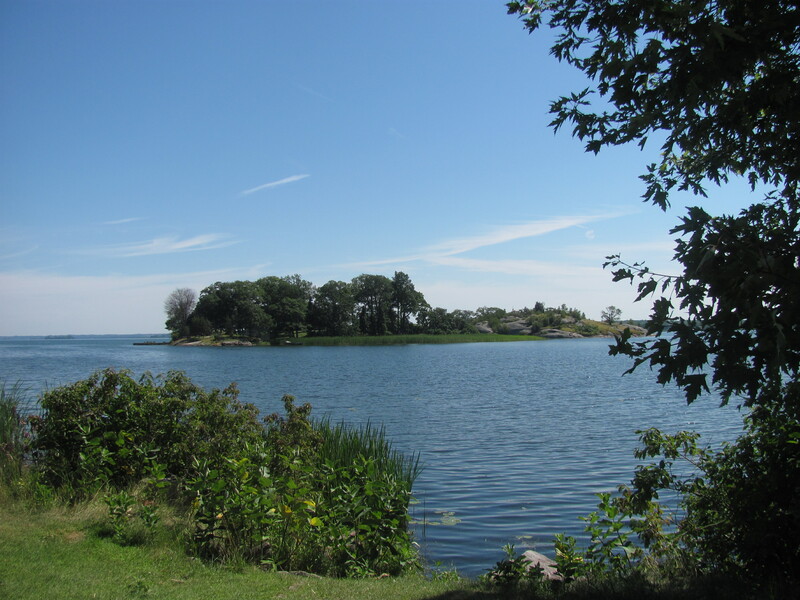 We started off with another sunny day and delighted in the familiar scenery of the Thousand Island highway which we decided to take along the way to relieve ourselves of the boredom of the 401. One of the Thousand Islands. As we were approaching Toronto, the sky turned an ominous grey a prelude to the torrential downpour we would soon come face to face with once we got on to the 407. This was the first and only bad weather we experienced on our whole trip! By the time we reached Burlington, it had all cleared up. That night we celebrated Hubby’s birthday for the third time with his sister, brother-in-law, and their daughter and her family. Celebrating this time with balloons. With sister who also has the ‘Young Age’ gene. 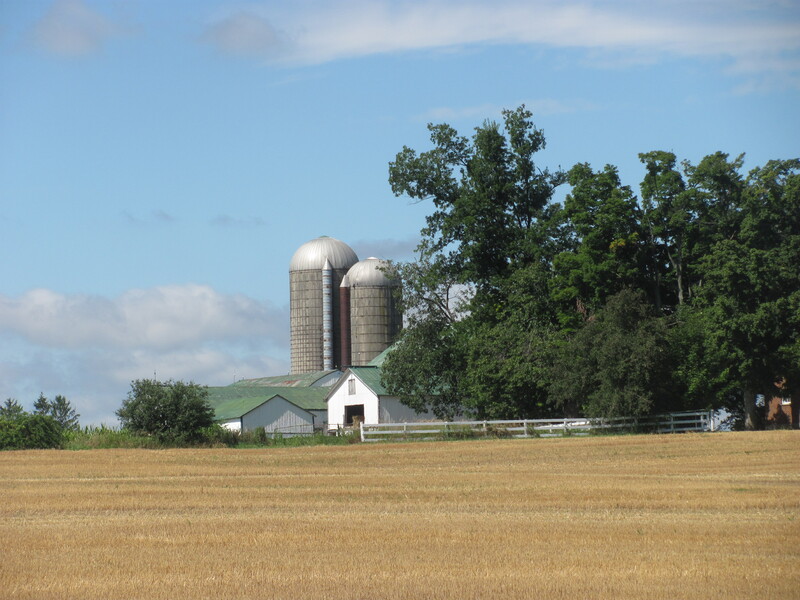 The following day – another stunner with a clear blue sky and a comfortable temperature – took me to Georgetown to visit two dear friends from my past life in Ontario. We gathered in Cynthia’s beautiful garden for lunch accompanied by their two spouses and Cynthia’s grandson. Hubby wasn’t able to come since he had planned to meet up with an old friend and a cousin in Toronto. 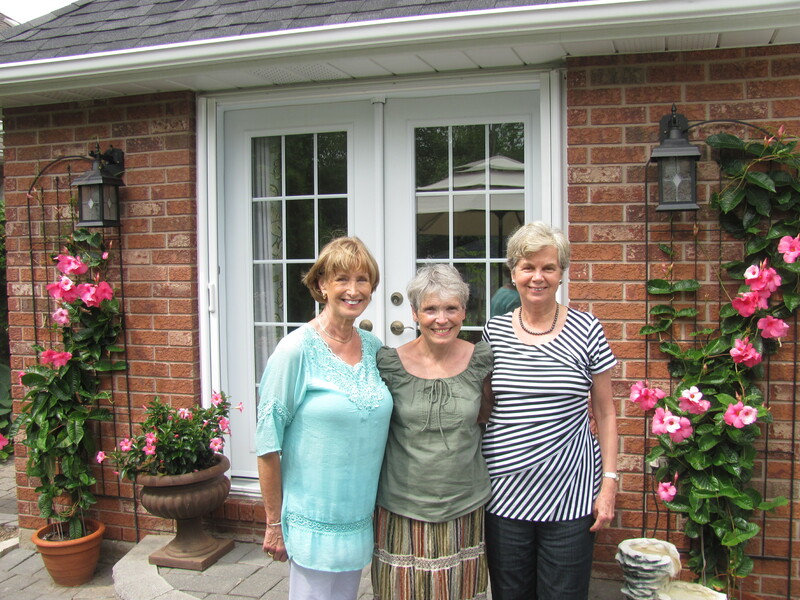 We all agreed it was just like times past and marvelled that we could still come together so easily to catch up with our fast-moving lives and share a few laughs. On the Wednesday of the 12th we had to head back home which was all too soon. By choosing the quickest and easiest route that would get us to the ferry in St. John on Friday for the 2:30 p.m. crossing, we opted for one of the routes plotted out by CAA taking us through the US. This route took us through New York state, into Massachusetts, part of New Hampshire, and finally into Maine. Although it might have been a tad quicker than the Canadian route we took to go up to Ontario, it was by no means the cheapest. With the sinking value of our dollar and the fact that we were travelling through the US on one of their busiest tourist weeks which drove up the price of accommodations and food, we spent far more than we had anticipated. Most of our journey found us on the toll roads which are exceptionally well-marked and maintained compared to our Nova Scotian roads. 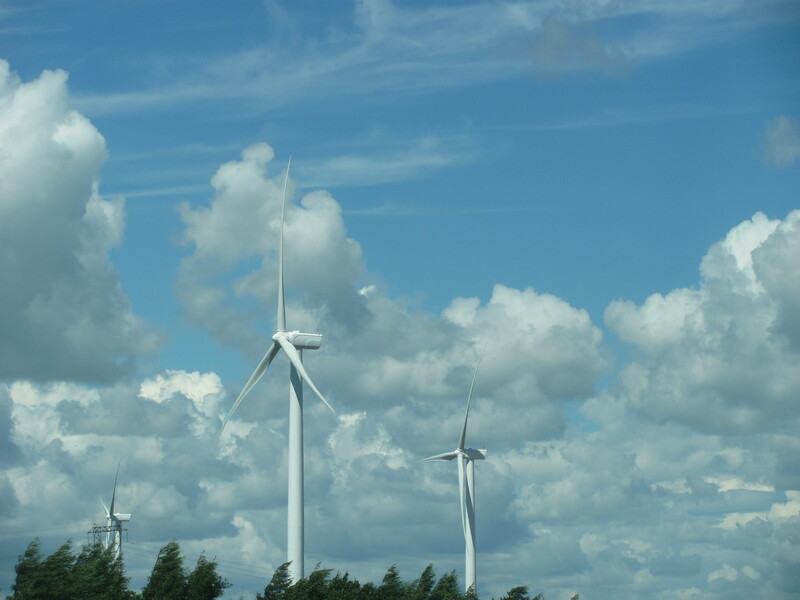 However, once the monotony of yet another service centre with tasteless fast food (the only good thing was the cappuccinos I was able to buy at MacDonald’s), we found ourselves seeking out a couple of small towns off the beaten track. 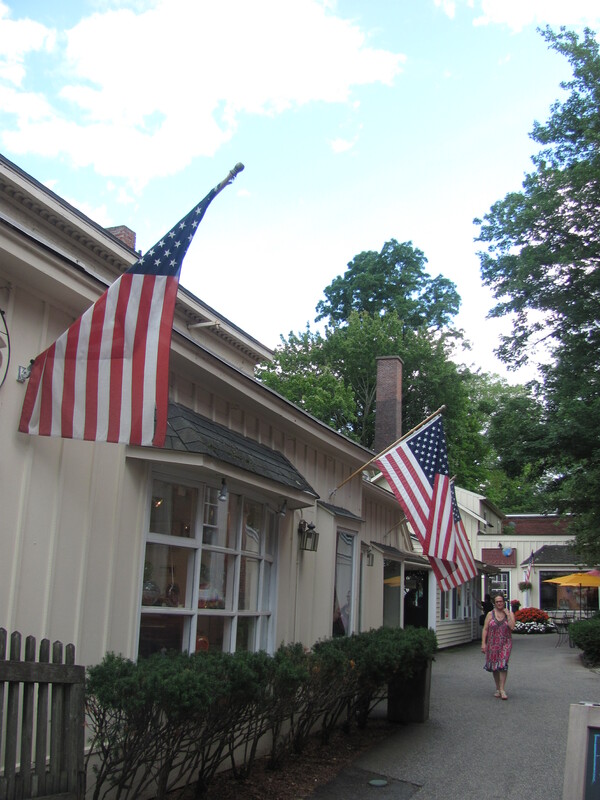 Our first one was the town of Stockbridge in southern Mass, the home town of Norman Rockwell, which exemplifies the typical New England town. Main street in Stockbridge, Mass. Wishing we could have stayed here. I wish we could have bunked down for the night in Stockbridge, but instead we decided to stay in Worster not too far away where surely we could find something under $100 and within our budget. Unfortunately, Hubby and I came way off the same page when it came to what and where we wanted to stay. After many wrong turns and screams from him who was starting to panic while we looked for the Econo- Lodge which appeared to be within the budget, we found ourselves back at the Quality Inn where we had begun. I think the nice chap on reception took pity on us for when we returned after failing to find the Econo- Lodge, he lowered our room price to a comfortable $80 with taxes and exchange. After a night of too little sleep and a very unhealthy breakfast in my estimation, we got off to an early start making the decision to get off the toll road since we had made our reservation for the next night in Bangor at another Quality Inn for well above our budget at $190! I knew I could find something less on a back road somewhere, but to keep the peace of mind that Hubby insisted upon, I kept quiet. 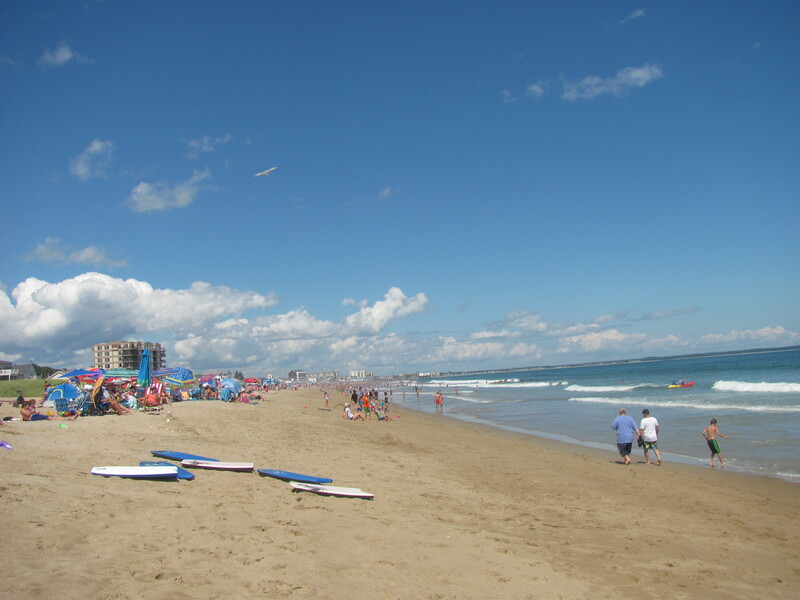 We made our first stop at Old Orchard Beach and the nearby village of Ocean Park Beach which is supposedly a bit more upscale, according to Hubby. Every summer he and his family would spend time at this beach so it was for ‘old time’s sake’ that we ventured in to walk the beach and have a good lunch. I had enough of the service centre food with their ridiculous prices. Ocean Park Beach in Maine. 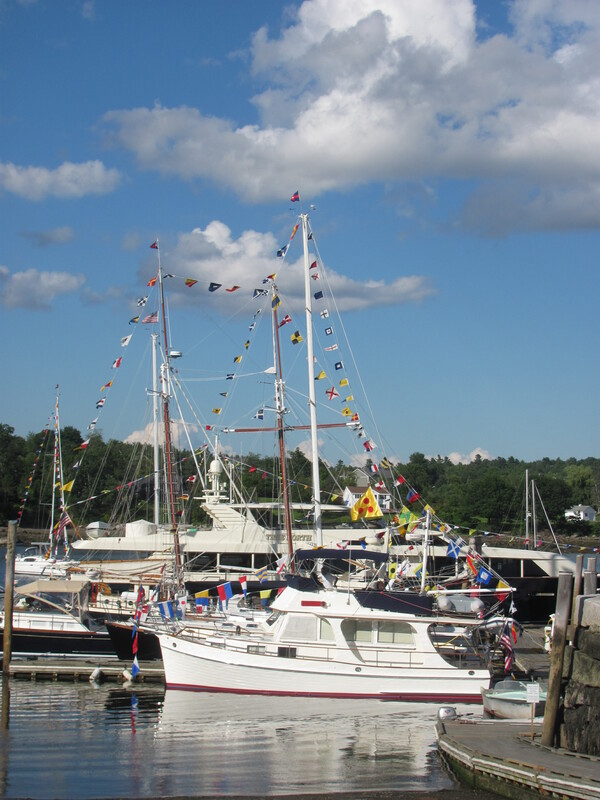 We also made a stop at Belfast and so pleased we did as it is one of the more quaint towns along the Maine coast. After wandering around the harbour taking a peek at all the huge yachts and poking into some of the cute boutiques, we settled on Darby’s Pub for a delicious dinner. Our last night on the road was fairly uneventful. The breakfast the next morning was slightly better than the night before with the addition of waffles that we made for ourselves. However, for good coffee, I had to hold off until we crossed the border back into Canada when we made a quick stop at St. George, NB. There we found their General Store where people were lined up at the door for their home-made sandwiches, baked goodies, and Java coffee which is roasted and sold in St. John. What a surprise for me because they do delicious flavoured coffees so I treated myself to their ” J’maka me crazy” flavour. We made it to St. John in good time for the 2:30 crossing to Digby. We had to wait for more than an hour to drive on but once there we were in for a pleasant surprise. The new Fundy Rose had just been running for little more than a week so naturally we were anxious to see it, and we weren’t disappointed. I can honestly say it’s beautiful with tastefully decorated restaurants and sitting areas, an upper deck with a bar where passengers can sit outside and be close to the water. We had another beautiful day so it was very comfortable to sit there. If the weather is bad, then there is lots to do inside with two areas for up to date movies, a play area for the kiddies, and usually some kind of information session or entertainment. The day we crossed had a young lady performing some Celtic music. On a final note, the food prices are so much more reasonable than those we encountered in the US. There is no comparison to a $4.95 sandwich on the ferry and a $6.95 US one at a service centre on a toll road. 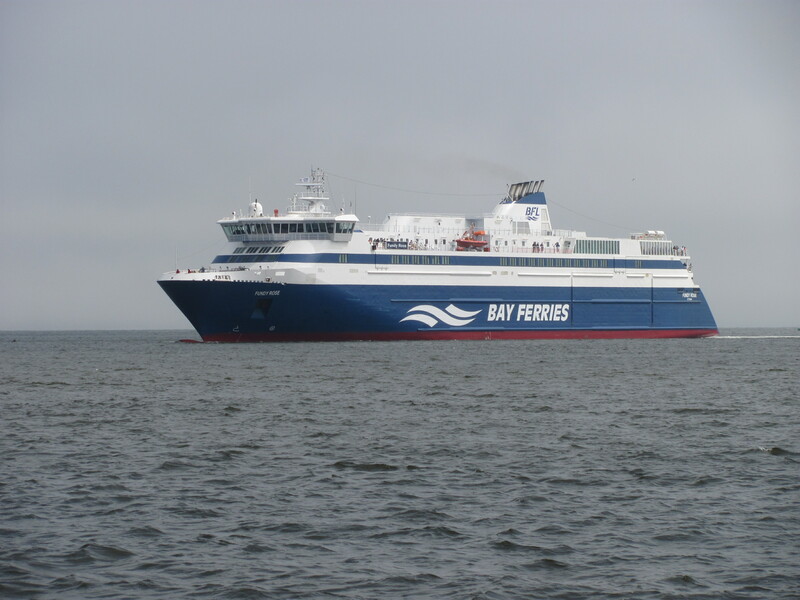 The Fundy Rose coming into St.John. 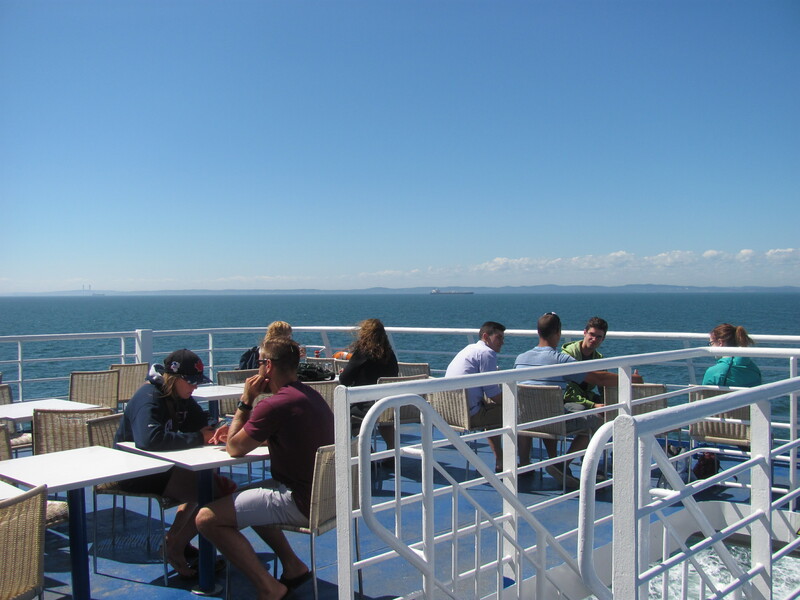 On the upper deck of the Fundy Rose. As I look back on our 8-day whirlwind trip, I realise how good fortune once again reigned over us. We were blessed with good weather, no accidents or car break downs, wonderful families, and faithful friends. Not only was this the highlight of our summer, but also a time for reflection on the passage of time as we enter our later years. May we both be forever young if not in body but in spirit.